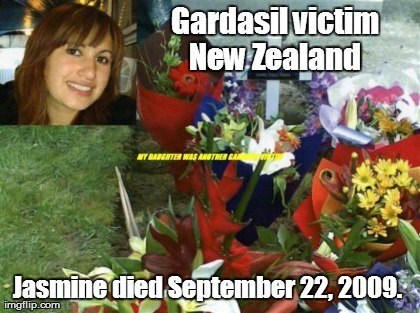 [2010 Jan. Gardasil deaths NZ] Open Letter to Dr Stewart Jessamine from Hilary Butler The fact that at least THREE teenage girls died in their sleep between 1 September and 30 November 2009. These are only the ones we know about. One of those, Jasmine Renata, is confirmed as receiving the full Gardasil series before she died. Dr Shaw suggested that at autopsy, destruction of motor neurons should be looked for in brain samples, and the Morin stain for Aluminium should be used to ascertain it’s presence in the brain. On enquiry, it was found that New Zealand’s autopsy protocols would not accommodate either. · How can we have any confidence in a coroner’s finding, when the autopsy doesn’t contain tests (which a doctor knowledgeable about the action of aluminium vaccine adjuvants in animals), considers crucial, in order to solve Jasmine’s case?